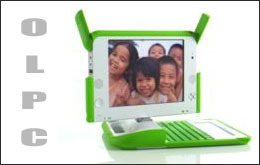 The Reliance Anil Dhirubhai Ambani Group (ADAG) has collaborated with One Laptop per Child (OLPC) foundation to bring the latter’s much-hyped $100 laptop to India to promote e-learning among poor children. Under this initiative, Reliance Communications (RCom) will provide Internet connectivity, network backbone, logistics, and support to the OLPC initiative. The initiative aims at covering over 25,000 towns, and 6,00,000 villages in the country by 2008. The larger OLPC project has already provided laptops to 5 million school children across the world, and aims to cover 150 million by 2008. OLPC and Classmates from Intel are good schemes. I just don’t believe they are going to bridge a digital divide so easily, as they claim to achieve. In fact I’m not sure I like the term Digital Divide that much – the real divides are much deeper than just digital; they are linked to the digital divide but will not go away with an OLPC. I’m all for ICT for development, and do believe that technologies can enable change and help people better their lives – I just hope they don’t create other divides. Where some children have them and others don’t. Where adults intervene and wrest them away from the children. Where more powerful caste groups get them and the lower castes are left out – I say this because I have seen this divide in village schools over and over again – where benefits (such as school uniforms, free meals) that are meant for all children, are ‘hoarded’ away by the more influential upper castes. Where a new breed of agents and middlemen come into play, creating yet another layer that divides society. Where the entrepreneur in the Indian sees opportunities to make money out of either selling the laptop or selling time on it. And who’s going to guide usage and mentor these children – teachers and parents in these areas are digital ignorants. Then maybe, kids are smarter and they will teach themselves. Or the OLPC will be their teacher. Perhaps, because it’s not the government, but The Reliance Anil Dhirubhai Ambani Group (ADAG) that is bringing the OLPC to India, I’m hopeful that at least it will be more professionally managed. At the same time, it is a private sector profit-making enterprise – I hope business does not drive their management of the project. The OLPC will die, and we will continue to sing “Long Live the OPLC”, or the Classmate, or the Eee, and all the multitude of pretenders to come. We will celebrate its gift in the same way that we sing the praises of SANSKRIT some 1,000 or 2,000 or 10,000 years after its birth (your historical perspective), in its modern voice that some call “Indo-European”. In time, the OLPC and its pretenders will help us understand our deepest and most ancient human commonality, that minute genetic mutation of some 200,000 years ago that enlightened humanity from its ancient cradle in the dark African continent, which we now call “FOXP2”, and help us overcome the divisiveness of human ignorance. There is little doubt that some(maybe too few)children in South Africa’s Cape Flats and Diep Sloot enclaves, the troubled youngsters of Brazil’s Favelas, and many “low caste” children of Kolkata and Mumbai, will survive without knowing the courage of Nicholas Negroponte, but the revolution he began will touch their lives most intimately. History will repeat itself in the same way that the knowledge of the ancients who gave us the written word prevailed over the burning, destruction, hoarding, theft and big business reticence of their wondrous manuscripts in modern Europe and ancient Peru. Their legacy in the form of little digits of electrons and photons sent to the flickering screens of OLPCs on wireless mesh newtorks will light up the unstoppable path of human knowledge. We will continue to argue over the economics of OLPCs and that the children of Niger who must survive on less than one dollar a day cannot afford its luxury, in much the same way that the old manuscripts of ancient Athens and Egypt were accessible only to the wealthy or well-connected, but their messages survived to inform us in this 21st century of the dangers of human ignorance. I personally, an African who succeeded in cutting through the barriers of ignorance using the “Slide Rule” predecessor of the OLPC, will support the concept in anyway that I can. I say “Long Live the courage of Negropnte and his friends, and his OLPC and all its pretenders. Screw the OLPC solution… a 100$ laptop from the US is a joke. When we can do far far better. The US come across as a bunch of big time retards with this one… lol 100$ when it can be done in half the price… and trying to sell it to their papa’s in programming is even more laughable. Next post: What does being in ‘beta’ mean?